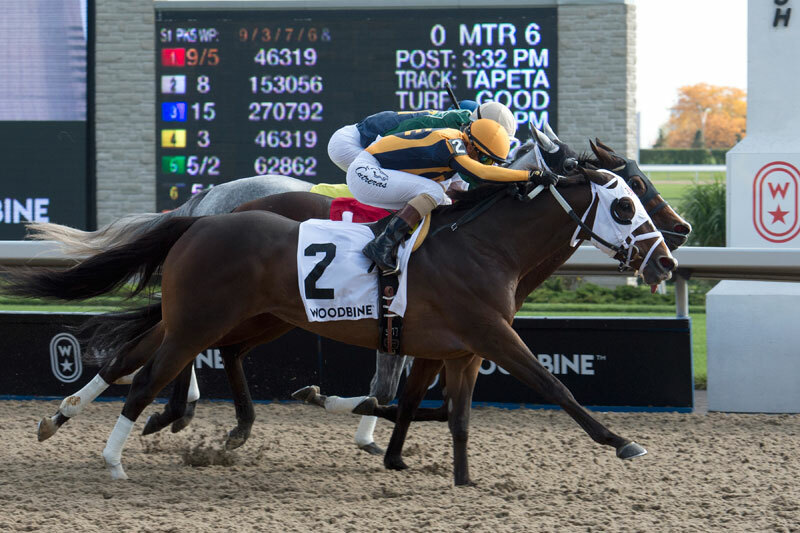 Devine Mischief, the first Canadian starter for trainer Joe Sharp, was up in the last jump to edge out Glamanation and Jean Elizabeth in a thrilling three-horse conclusion to Woodbine’s 6 1/2 furlong Ruling Angel Stakes on Sunday. Luis Contreras was in the irons as the 8-1 chance prevailed by a head over 9-5 favourite Glamanation with Jean Elizabeth another neck back in third. The $100,000 Ruling Angel, an overnight stakes for three-year-old fillies, attracted a field of eight including four from south of the border. “I got a really good trip,” said Contreras, who was riding Devine Mischief for the first time and recording his eighth stakes win of the meeting. “I saved all the ground in the turn and once I turned for home, I found my way to the side and I’m glad I got it done at the end. Alexandra Kay, invading from Presque Isle Downs, was first to show from the outside post but was quickly engaged by Illinois invader Jean Elizabeth, who led through a quarter in :22.36 and a half-mile in :44.88. Glamanation, after beginning from post one, had glided up into third heading around the far turn and slipped off the rail to engage Jean Elizabeth as they straightened out for home. Those two locked horns in a furious battle with Glamanation holding a brief lead through six furlongs in 1:09.78. But Devine Mischief, who also had saved ground early and swung out turning for home, was closing steadily on the leaders and was up in the nick of time to record her first stakes victory. Jean Elizabeth, the 3-1 third choice, ended a neck behind Glamanation in third with Ravinia, the longest shot in the field, another 4 1/2 lengths back in fourth at 54-1. Rounding out the field were Miss Savvy, the 5-2 second choice Win the War, Alexandra Kay and Bint Huwaar, who had shipped in from Kentucky. The final time was 1:16.44. Devine Mischief, a Kentucky-bred who races for Breeze Easy LLC and has been training in her home state, was winning for the fourth time in eight starts. The daughter of Into Mischief had placed in Belmont’s listed six-furlong Jersey Girl this June but was coming off an eighth-place finish over a sloppy surface in the seven-furlong Dogwood at Churchill Downs. The Ruling Angel was her debut on a synthetic surface and came over the sixth racetrack at which she has appeared in her brief career. Devine Mischief returned $18, $7.10, and $3.70 and headed a $58.80 exactor with Glamanation ($3.70, $2.40). Jean Elizabeth ($2.70) completed a trifecta worth $182.90 and the $1 superfecta with Ravinia came back at $849.90.